High Blood Pressure Or Even Prevent It? HBP Guidebook is a revolutionary program for high blood pressure treatment. Know that your body can heal itself of chronic diseases when you supply it with the right nutrients that nourishes at a cellular level. Then when it is cleared of poisonous substances it can begin the process of healing itself. Its easy to do, you just have to be focus. Make sure nutritional therapy is a major part of your lifestyle. Mark Hyman, MD, Chairman of the Institute for Functional Medicine gave a presentation in San Diego, California, at the Science and Clinical Application of Integrative Holistic Medicine conference on Redefining Diseases, recommended "diet and change of lifestyle along with supplements and body-mind resources over pharmaceuticals". This is where my HBP Guidebook toward optimum health comes in. Whatever disease you may have, you along with your team of Nutrition Health Coach and Doctor can reverse the damage to your body. This is accomplished by "treating the system within your body - not the symptoms; the cause - not the disease" according to HuffPost Social News. With all these verification in place I have used these proven step to lower my high blood pressure numbers and attain a quality healthy lifestyle. This definitive high blood pressure guidebook will help you to focus on achieving your optimum health. Just two weeks into your lifestyle restructuring, exercise and stress management along with a more focus look on your diet have you feeling vibrant. Nutrition plays a big part when you consume plant base foods that are high in minerals and vitamins. Weight reduction is possible, just losing a pound lessen 5 lbs off your joints. Exercise endurance improves. In time aches and pains ease. A newfound resolve is formed. You and your Cardiologist are happy. High blood pressure is such a devastating disease you must include alternative treatments that complements your lifestyle and will not affect your blood pressure medication. The additions usually help your Doctor in deciding how you may lower your medication dosage. Reversing your high blood pressure with my HBP Guidebook is possible, if you are willing to do the work and reclaim your health today. This book does not tell you to stop taking your medication. Even if your medication has terrible side effect. In fact if you have terrible side effects you should tell your Doctor, because there are many other types of drugs he or she can recommend. In "Your Definitive High Blood Pressure Guidebook Towards Optimum Health" I reveal specific ways I reduced my high blood pressure from 160/100 to between 117/79 and 121/82 naturally. This guidebook was written because I wanted to share my discoveries on the different and complementary ways I was able to reduce my high blood pressure. Now you too can do the same by incorporating these changes into your life. I was diagnosed with HBP in 1996, it was 160/100. My blood pressure skyrocketed after the death of my Mother. I thought I would have to be on medications for the rest of my life and probably develop diabetes - a natural progression, since my family also has a history of high blood pressure. But, with my research I found that this does not have to be so. Since then to now, and after being on all different types of high blood pressure medications with many side effects, I have found many proven ways to control my high blood pressure. You too can do the same, so start your journey on controlling or lowering your high blood pressure levels. Here's to your good health and success. Most individuals, the medical field says approximately 30%, are not even aware their blood pressure levels are in the danger zone. This silent killer can also contribute to you developing diabetes, Alzheimer's disease, dementia and high cholesterol. The good news is that high blood pressure in most cases can be controlled or even reversed by just taking charge of your nutrition. This will most likely decrease your dependence on drugs that may have dangerous side effects. Your HBP Definitive Guidebook Towards Optimum Health walks you through some of the proven steps in taking back your control. Now you can benefit from my proven steps of action in lowering your high blood pressure. 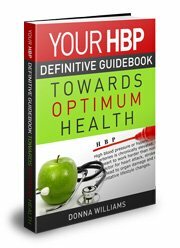 Review Your HBP Guidebook Towards Optimum Health, Table Of Contents and you'll see that I have listed everything you need to begin. What Symptoms Does HBP Show? How HBP affects your body? This HBP Guidebook is 83 pages featuring concise and effective alternative treatments and steps on achieving your own optimum health. Begin to take control of your health now with the PDF instant download for the very low price of US$19.99. Get your copy today and get started. Return to Info On High Blood Pressure from HBP Guidebook.